The Ragdoll cat breed originated in Riverside, California in the early 1960s. Their unique habit of relaxing and going limp when you pick them up earned them the name Ragdoll. There has been some controversy and several myths surrounding just how the foundation cats acquired this trait. Nevertheless, Ragdolls have become one of the most popular and largest-growing cat breed in the history of the cat fancy. Ragdolls are large with beautiful, oval blue eyes. Their body is lighter colored with darker points on the face, legs, tail and ears. 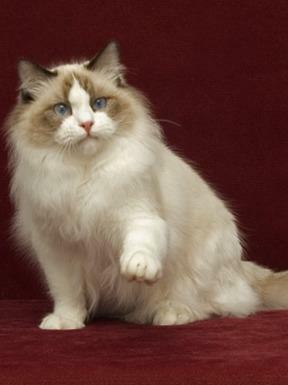 Ragdolls come in three traditional patterns; colorpoint, mitted, and bicolor. The traditional colors are blue, seal, lilac, and chocolate. The ideal Ragdoll is a well balanced cat, with no extreme features. Altered males may reach 20 pounds or more, females are proportionately smaller. Kittens are born all white, reaching full coat color at two years, and full size and weight at four. Ragdolls adore their humans. They will shadow your movements, wanting to be a part of whatever is going on in your home. They run to greet you at the door, follow you from room to room, flop on you and sleep with you. They feel that humans prefer purrs to yowls and keep their voices softly musical. They tend to be easily trained. Some learn to play fetch and can be easily trained to a collar and leash. Even traveling with a Ragdoll is easy if you start training early. They make loyal and devoted pets. Ragdolls are gentle, carefully avoid scratching people, and are good with children, the elderly, and dogs. They are easily introduced into multi-pet households. Ragdolls must be kept indoors or a secured area because their sweet, passive nature makes them very vulnerable. Ragdolls are possibly the most relaxed of all the domestic cat breeds. Their moderately long, silky coats are mat-resistant. Since Ragdolls have no undercoat, they lose less hair than other long-haired cats. They rarely have hairballs, are well behaved, and eager to please. There are no specific health problems associated with this breed. Website, all content, photos Copyright © 2019 Longfellow Ragdolls-theragdollmama.com. All Rights Reserved.